When we last took a look at Cincinnati a few weeks ago (and do go back and take another visit - it's been updated! ), we saw the AMs on the Kentucky side, then promised that we'd cross the Ohio River for our next episode here at Tower Site of the Week. And we will - but first, one last stop, just barely in Kentucky. As I-71 and I-75 join forces and rush downhill on the northbound approach to the river, drivers get to pass one more AM tower, if they happen to be looking off to the right at just the right exit. There it is at the left (photographed, precariously, from a car briefly stopped at the edge of the exit ramp - kids, don't try this at home! ), WTSJ (1050), running 1000 watts by day and 279 at night from this little stick nestled in the offramp. Yes, the sign says "AM Stereo," and yes, they were running AM stereo when this picture was taken in 1998 - they're in glorious mono now with their religious programming. And no, I have no idea whatsoever what that weird Yagi-type thing atop the antenna is there for. "Baby, if you've ever wondered, wondered what ever became of me...I'm living on the air in Cincinnati..."
Yes, a whole generation of us now associates "Cincinnati" with flying turkeys, Les Nessman, Dr. Johnny Fever, the Big Guy, and of course Jennifer. (Did you know the show was almost called "WKRP in Rochester?" That's what we're told, and who are we to argue!) That most famous of fake radio stations has some real Queen City credentials: that's really Fountain Square in the opening sequence, of course - and that was a real Cincinnati broadcast tower posing as "WKRP," too. 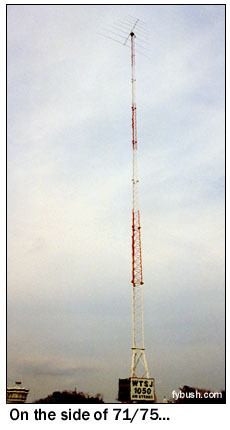 It wasn't an AM tower, though; it was one of the self-supporting TV/FM towers that dot the hilly urban neighborhoods just north of downtown Cincinnati. On the way there, we head through Eden Park, east of downtown along the river, home to the little WDBZ (1230) tower. WDBZ is the former WCPO, and later WUBE, one-time challenger to WSAI for Cincinnati's top 40 audience. Now it does talk for the city's black community. North of Eden Park, on Dover Street just south of McMillan Street, we find the easternmost of the TV towers, this one home to WCPO-TV 9. 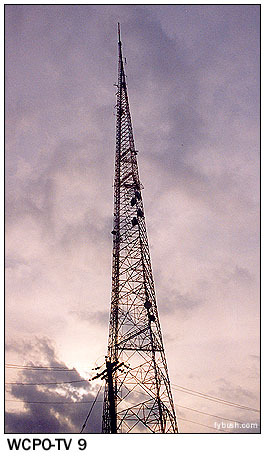 When we visited in 1998, this tower also carried WUBE-FM (105.1, the former WCPO-FM) and WEBN, the outrageous Jacor-owned rocker at 102.7. WEBN has since moved, but Xavier University's public radio WVXU (91.7) has taken its place. These are neat towers, to be sure - but they're not the tower that was shown in the opening sequence of WKRP. That tower, seen in the background in the photo at left, is about half a mile to the west at 2222 Chickasaw Street, and back in 1978 it was home to NBC affiliate WLWT (Channel 5). Read those calls "WLW-T," if you're historically minded; this was the sister station to WLW radio and the flagship of the Crosley/Avco television empire that stretched to Columbus, Dayton, Indianapolis and even Atlanta. Jeff Davis, the morning show producer from WRRM (98.5) in Cincinnati, checked in with us to definitively pinpoint that very tower as having been the one shown on WKRP, and for that we thank him. 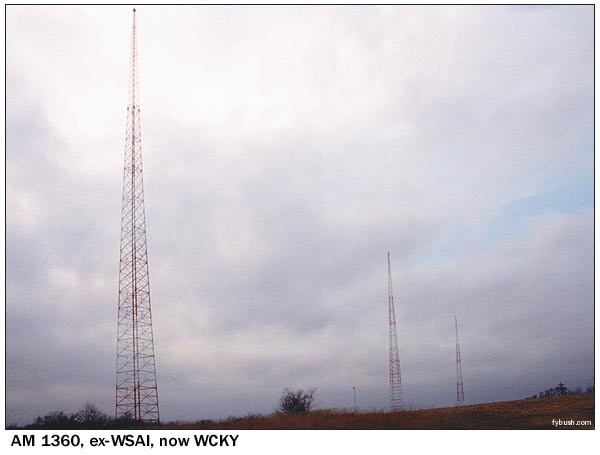 WLWT now uses the much taller tower in the foreground of this picture; this site is also used by public television WCET (Channel 48) and public radio WGUC (90.9). Across I-75 to the west, a much less exciting (and not pictured here) guyed tower is home to Fox affiliate WXIX (Channel 19, licensed across the river in Newport, Kentucky) and to Jeff's WRRM; a shorter tower about a mile to the south is home to urban WIZF (100.9 Erlanger KY) and Clear Channel hot AC WVMX (94.1). I-75 meets the end of I-74 about a mile north of WXIX; continue north from that split another mile or so and you'll be in the vicinity of one of the most picturesque towers in the nation. At the corner of Winton Road and North Bend Road sits the "Star Tower," the graceful curvy steel contraption seen above at right. 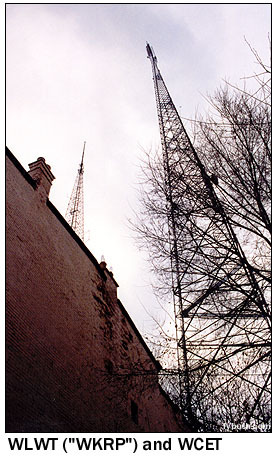 I've seen only three towers like this in the country: this one, home to WB affiliate WSTR (Channel 64), rhythmic oldies WMOJ (94.9) and oldies WGRR (103.5); a tower on Georgia Avenue in Washington DC that's home to WB affiliate WBDC (Channel 50) and C-SPAN's WCSP (90.1); and the KEOM (88.5) tower in Mesquite, Texas featured here a few weeks ago. A short drive west on North Bend Road brings one to WAKW (93.3), Pillar of Fire's big class B religious signal on a short tower on Collegevue Place in the College Hill neighborhood; head north on Hamilton Avenue and you'll come to the Mount Healthy neighborhood, now a prosperous place full of expensive homes and well-manicured lawns. And tucked away off Daly Road on what must be a very expensive piece of land these days is the three-tower site of AM 1360. 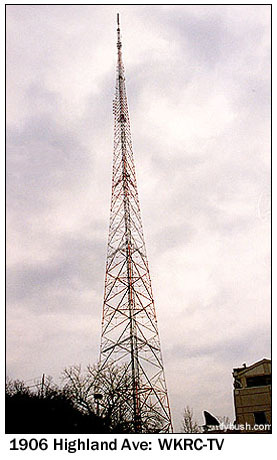 That frequency was WSAI for decades, of course, cranking out top-40 from these three towers. (And many years before that, WSAI inaugurated that site way up north of town in Mason that's now home to WLW!) Today, the call-letter shuffle has landed "WCKY" on this facility (which means all that's needed now is one last swap between 1360 and 1530 to set things right again), and it's doing sports as "Homer 1360." And with these three towers standing out against the clouds, we'll say so long to Cincinnati for now - but come back in a week, won't you, when we'll finish our Queen City tour with some newer photos taken just about a year ago. See you then! Want to see more neat sticks all year round? 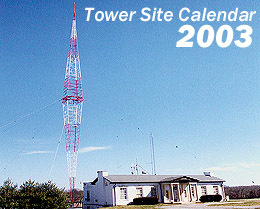 Nashville's WSM (at right) is one of the more than a dozen Tower Site images featured in the 2003 Tower Site Calendar, coming this fall from Tower Site of the Week and fybush.com. This year's edition is back from the printer, and shipping is underway. Orders placed now will be shipped within 24 hours! And this year, you can order with your Visa, MasterCard, Discover or American Express by using the handy link below!